Ackermann’s Repository of Arts, May 1809. I have multiple copies of this print. 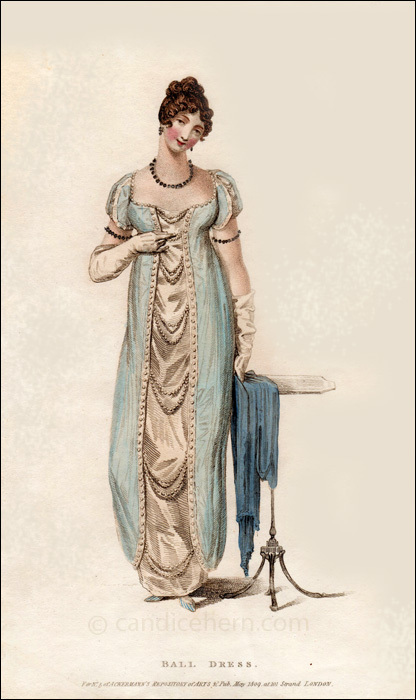 Most show the dress in white, but this one shows blue. The text does not specify the color of the dress. Note the bracelets worn on the upper arm. 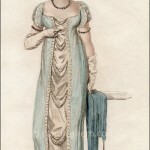 This was typical of the period, especially when above-the-elbow gloves were worn. 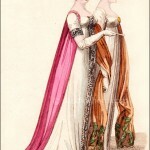 Bracelets and armlets were generally worn in pairs, as here. 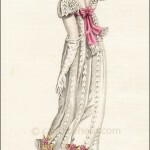 One seldom sees a single bracelet on one arm in prints of this period. And though the feet are almost too tiny to see (or to walk on! ), the striped slippers are very charming.